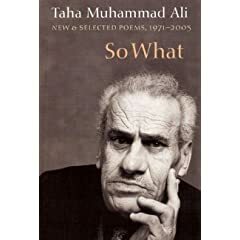 As burdensome as reading translations can be, knowing that you’re not getting the genuine article, but, rather, the genuine article through a filtered medium, reading Peter Cole’s translations of Taha Muhammad Ali’s poems seems a dictation of original voice. That is to say, it flows freely. Not surprising, seeing as I’m reading the words of an American. But the previous statement was meant more to convey that nothing seems forced or out of place in any of the poems in this book. Whether it is due to Cole’s dualistic language skills or the fluidity between Arabic and English, the flow and sound of every poem in this collection seems … right. The very first thing that I will say about Taha Muhammad Ali is one that should make you laugh, that made me laugh, that should incur great scorn from critics and fellow poets alike for being mentioned before all else. Taha Muhammad Ali operates a souvenir shop in Nazareth. This is the gist of the About the Author section. I hold this in as great as praise as I do scorn, because, while I, too, do not believe in About the Author sections as a relay of mounted accomplishments, I also note the marginalization taking place. A marginalization most ill-deserved, seeing as all his translators get more lines per page on the bio than the actual author. Taha Muhammad Ali’s poems carry what I love most about poets, a sense of humour. Not an overwhelming one, but a humour of reflection: a humility not only towards one’s self, but towards the world’s lack thereof. In a time and region that seems to be inundated with religious rhetoric for the sake of religious rhetoric and sheepish following for the same sake, he is a dissenting beacon amongst the gathered crowds at prayer. And his readers love him for it. With his reflections, Ali brings connectivity to a people disconnected from themselves, ourselves, a humanity all-encompassing.